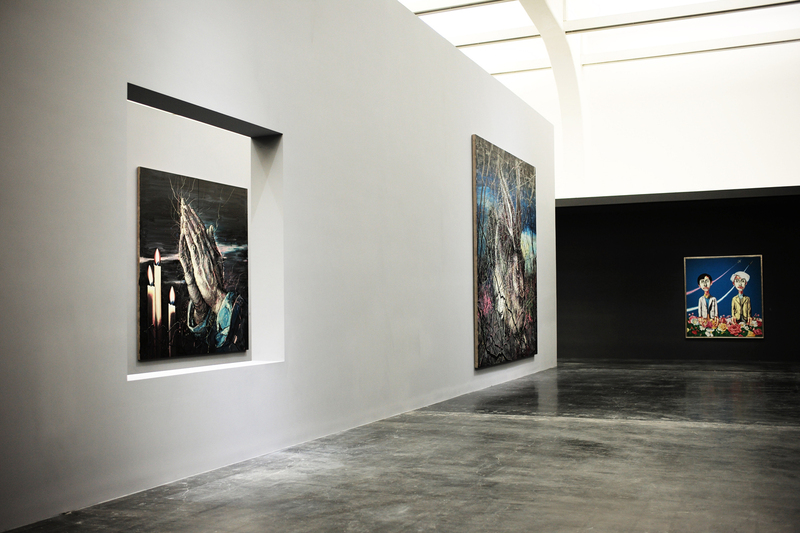 From 19 September to 19 November 2016, UCCA presents “Zeng Fanzhi: Parcours”, the artist’s largest and most comprehensive exhibition anywhere to date and his first institutional solo show in Beijing. 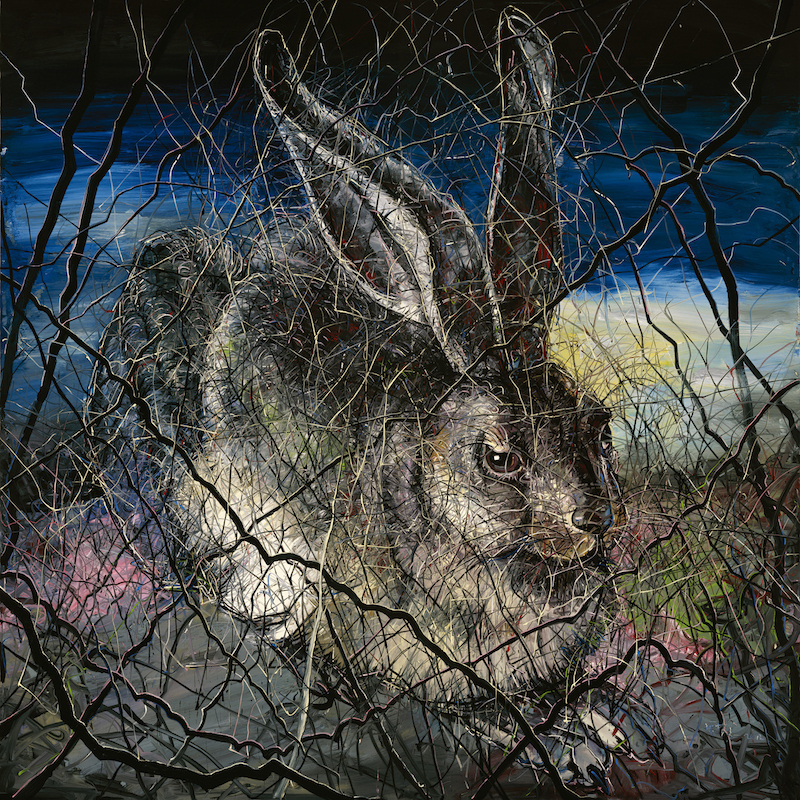 Including nearly sixty works borrowed from collections around the world, it covers nearly thirty years of Zeng’s creative output, winding through his extensive stylistic and thematic evolutions on canvas and in sculptural form. 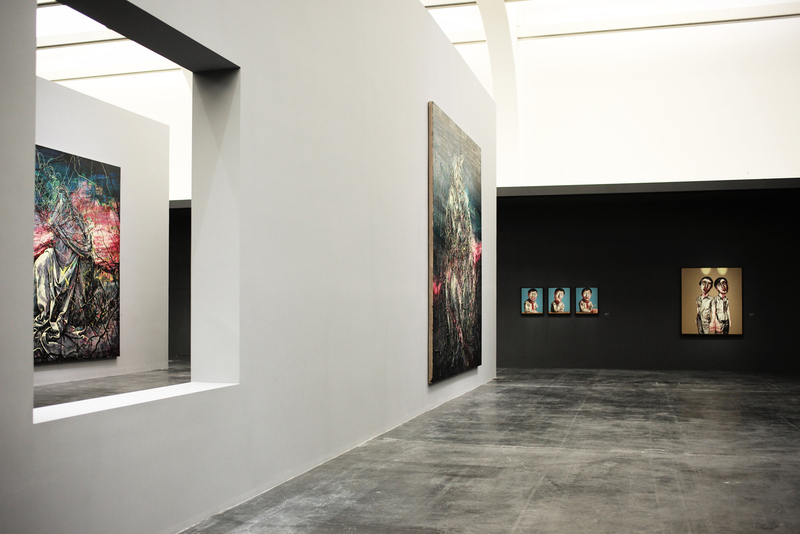 The main body of the exhibition in UCCA’s Great Hall features key works from each major series in Zeng’s career, presenting a complete picture of his creative exploration and artistic contribution, and referring to art-historical precedents from Hellenistic sculpture to Lucien Freud. It culminates in a room dedicated to a recent series of works on paper—never before exhibited in China—which mark a new engagement with the aesthetics of Chinese painting, and in the Nave, where a special space has been constructed to show two of his most substantial landscapes. Its title inspired by that of an early painting he completed in 1990, “Zeng Fanzhi: Parcours” offers to bring the viewer along on the artist’s creative journey. 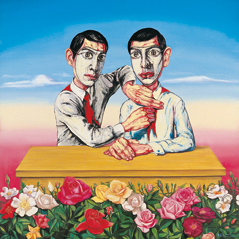 A key figure in the generation of artists who emerged, along with the very notion of “Contemporary Chinese Art,” onto the world stage of the early 1990s, Zeng has consistently used his works to reflect on the social and cultural climate of his country through a highly personal visual language. 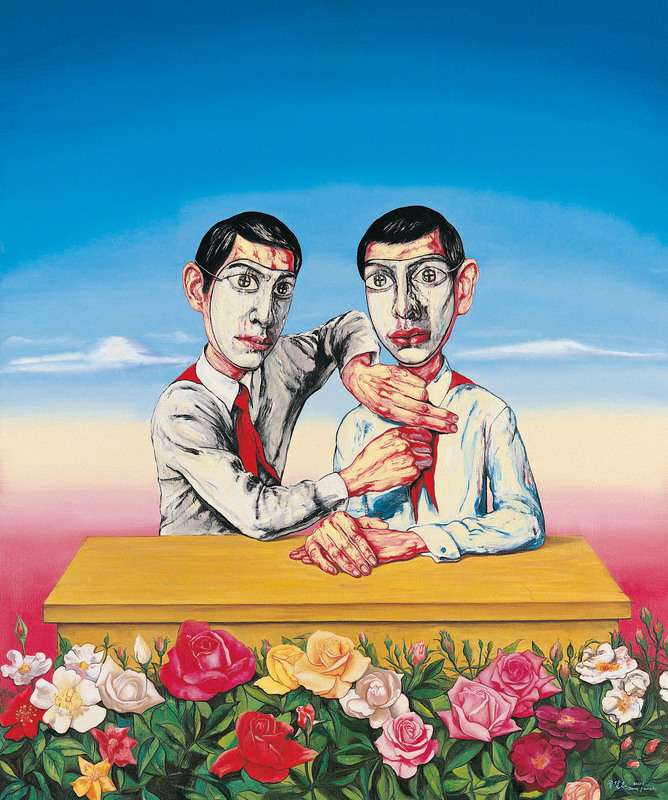 His early paintings, completed during the late 1980s while he was a student at the Hubei Institute of Fine Arts, combine the pedagogical apparatus of socialist realism with a romantic interest in Western classicism and modernism to depict new realities of Reform-era Chinese society. 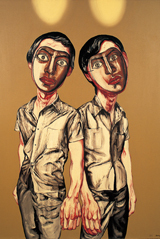 Following his arrival on the Beijing scene in the early-1990s, Zeng quickly gained recognition for his “Masks” series, which gives symbolic form to the dichotomies and affectations of that era through figures in varying states of alienation. 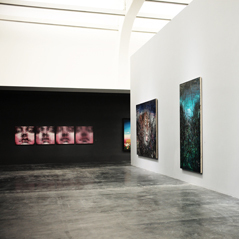 After this, Zeng continued his research into painting itself, producing the strikingly colored, tensely vibrating, monumentally scaled canvases of the “Abstract Landscapes” series. 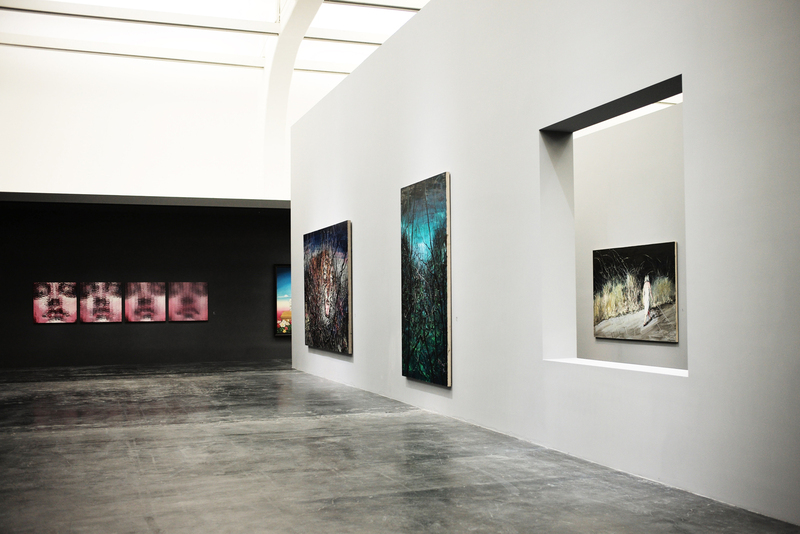 In recent years, he has combined the free-range brushstrokes of these landscapes with homages to works by masters including Leonardo DaVinci and Albrecht Dürer, in a series of seven four-by-four-meter paintings that have been extensively exhibited abroad. The newest works in this exhibition consist of a grouping of paintings in ink on paper which signal an introspective shift in his practice. Today Zeng fulfills a role inhabited by artists throughout Chinese history: an aesthete among the worldly, offering uplift and solace through refinement. 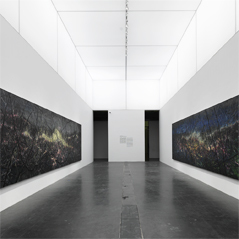 Its design carefully authored by the artist’s longtime collaborators Tadao Ando Architect & Associates, “Zeng Fanzhi: Parcours” rhythmically divides the expanse of UCCA’s Great Hall into an immersive survey of his career. 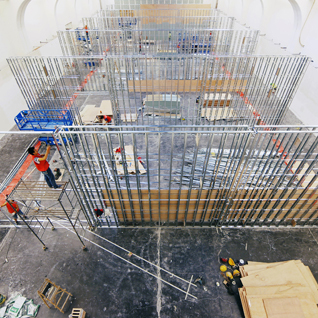 Six freestanding walls, each punctuated by a 2.4-meter square window, thoughtfully connect major shifts in the artist’s practice. 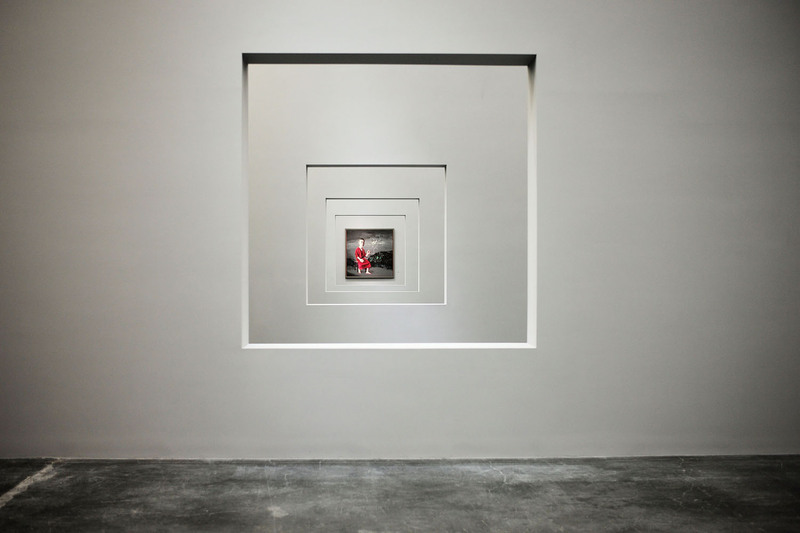 They are enclosed by a series of darker walls that run around the space’s perimeter, chronologically presenting portraits from all phases of Zeng’s career. 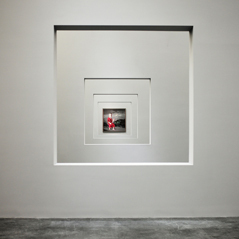 Having sought to avoid enclosed spaces, Tadao Ando has likened this layout to sections of an MRI scan that allow viewers to walk through layers of the artist’s mind. 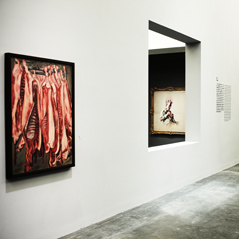 Zeng Fanzhi: Parcours is curated by Philip Tinari and Guo Xi, and designed by Tadao Ando Architect & Associates. The exhibition is supported by the Zeng Fanzhi Leadership Circle: SANLI HOLDINGS, Taikang Life Insurance Co., Ltd., Tianchen Times, Yunfeng Capital, Chiu Yeng Culture, Wang Zhongjun, and Zhao Xu. 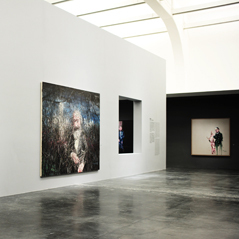 Special support comes from Pinault Collection. 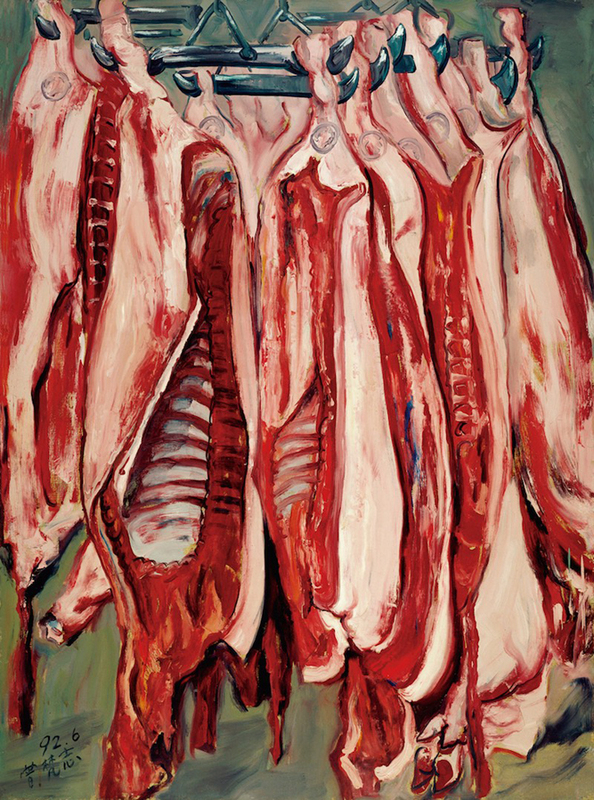 The patrons’ dinner is generously supported by Gagosian Gallery. Additional support is provided by Dior and Shanghart Gallery. 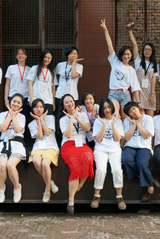 Lighting technology support comes from Hongri Lighting and KGM International Lighting Design. Additional production support for the works on paper comes from STPI Creative Workshop and Gallery. The exhibition opening events are supported by Mercedes-Benz, NUO Hotel Beijing, Castiglion Del Bosco by Massimo Ferragamo, and InStar. 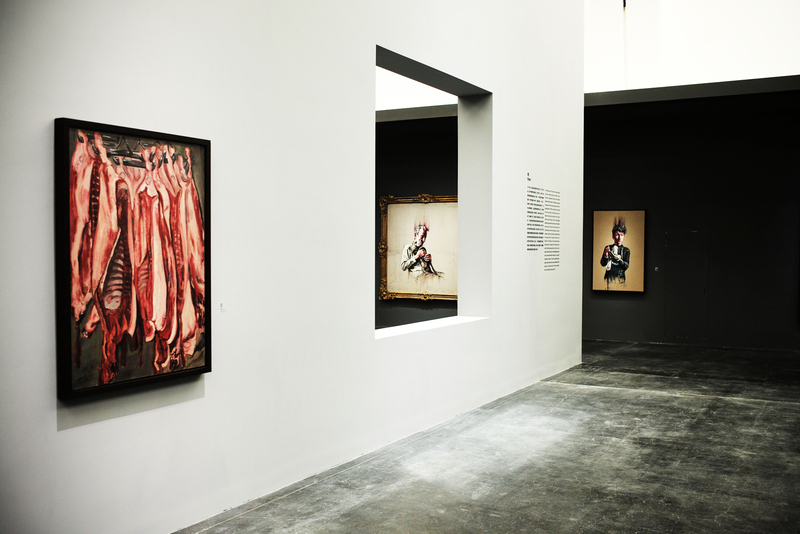 Exhibition-related merchandise is produced in collaboration with 3125C, CROQUIS, ZENS, echo, cam-in, and ART TIMES. 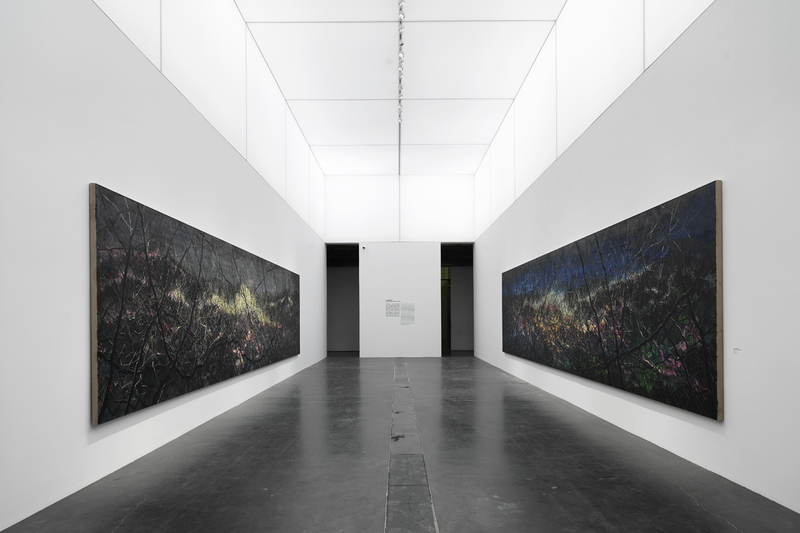 The eponymous monograph Zeng Fanzhi: Parcours, published by China CITIC Press, follows a spatial logic derived from the exhibition. The monograph includes essays by Philip Tinari and Karen Smith, as well as a dialogue between the artist and Alexandra Munroe, Senior Curator of Asian Art at the Solomon R. Guggenheim Museum, visiting each of Zeng Fanzhi’s distinct periods. Elsewhere, Tadao Ando shares his concept for the design of the exhibition, rewarding readers with further background on every angle of the exhibition. 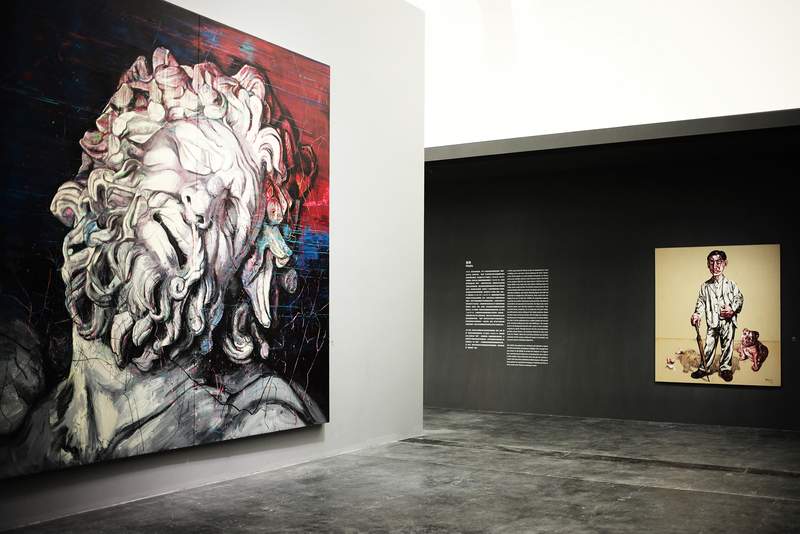 Zeng Fanzhi: Parcours is presented with support from Hu’an Publication. The monograph is available at UCCA Store. The exhibition is accompanied by a suite of public programs that includes a series of conversations inviting Richard Shiff (Effie Marie Cain Regents Chair in Art, University of Texas at Austin), Johnson Chang (co-founder, Asia Art Archive, Hong Kong), Pi Li (Senior Curator, M+ Museum, Hong Kong), Xu Yongmin (director, Hubei Institute of Fine Arts), and Cao Dan (professor, Hubei Institute of Fine Arts), among others, to discuss Zeng Fanzhi’s work in relation to the exhibition. Further discussions are hosted in Wuhan. 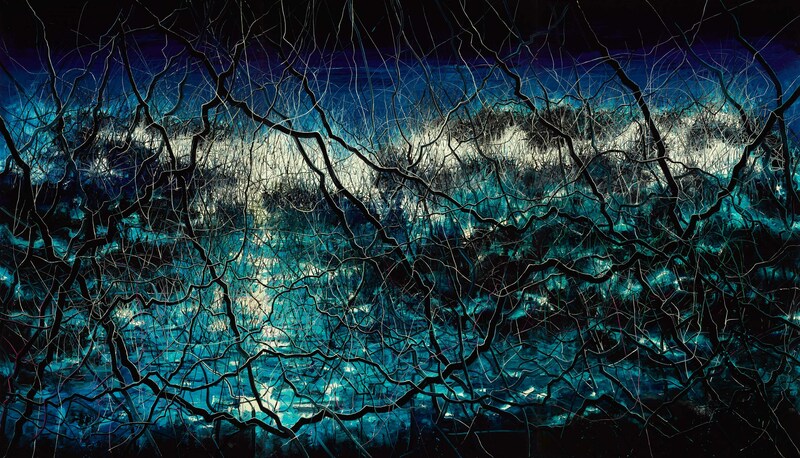 UCCA will also screen Zeng Fanzhi: YOU Art Project, an up-close study showing the artist in the process of creating one of his signature paintings. Zeng Fanzhi (b. 1964, Wuhan) graduated from the oil painting department at Hubei Institute of Fine Arts, and now lives and works in Beijing. 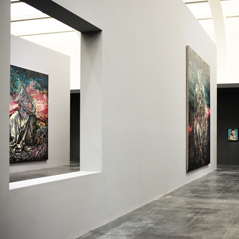 His solo museum exhibitions include “Zeng Fanzhi: Idealism” (Singapore Art Museum, 2007); “Zeng Fanzhi” (Musée d’Art Moderne de Saint-Etienne de Metropole, 2007); “Zeng Fanzhi” (Fundación Godia, Barcelona, 2009); and “2010: Zeng Fanzhi” (Rockbund Art Museum, Shanghai, 2010). 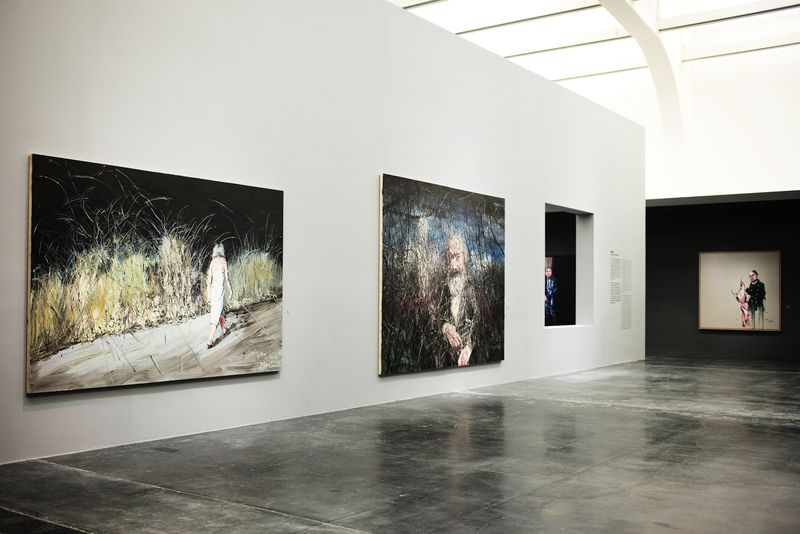 Zeng’s work was the subject of a major retrospective at the Musée d’Art Moderne de la Ville de Paris in 2013–14. In a specially commissioned exhibition at the Musée du Louvre in 2014, his painting From 1830 till now No. 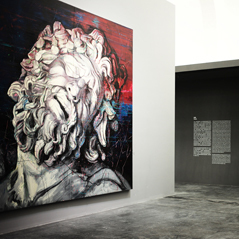 4 (2014) was shown alongside Eugène Delacroix’s Liberty Leading the People (1830). 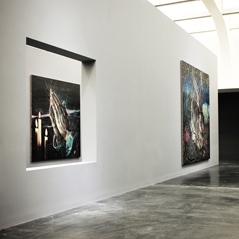 Zeng’s work was included in the China Pavilion at the 53rd Venice Biennale (2009); “The World Belongs to You” (Palazzo Grassi, Venice, 2011–12); “Ink Art: Past as Present in Contemporary China” (Metropolitan Museum of Art, New York, 2013–14); and “Paintings, Drawings and Two Sculptures” (Gagosian Gallery, New York, 2015). 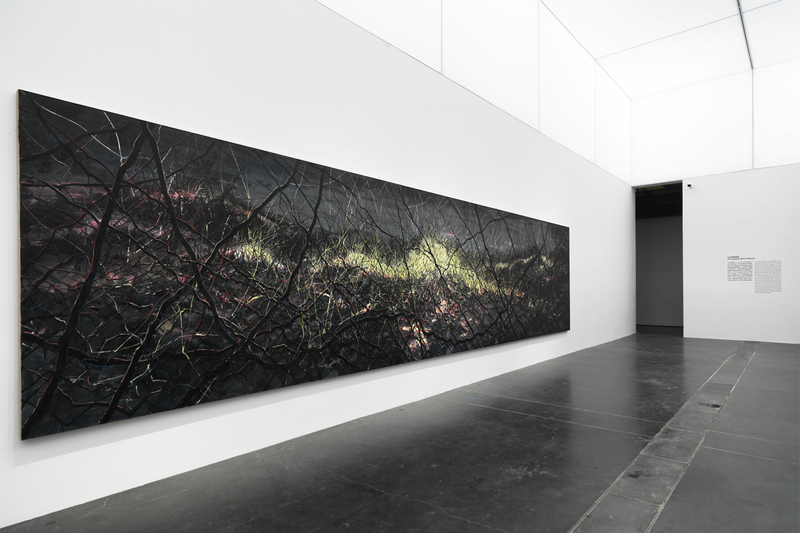 Download “Zeng Fanzhi: Parcours” press release. The following texts introduce the various bodies of work that will be on view in the exhibition. 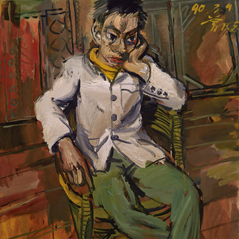 Completed during the interim of his last years at Hubei Institute of Fine Arts (1987-91) in his hometown of Wuhan, Zeng Fanzhi’s early works in oil on canvas convey the struggle of a young artist groping thematically and stylistically for forms that express the angst characteristic of that historical period. 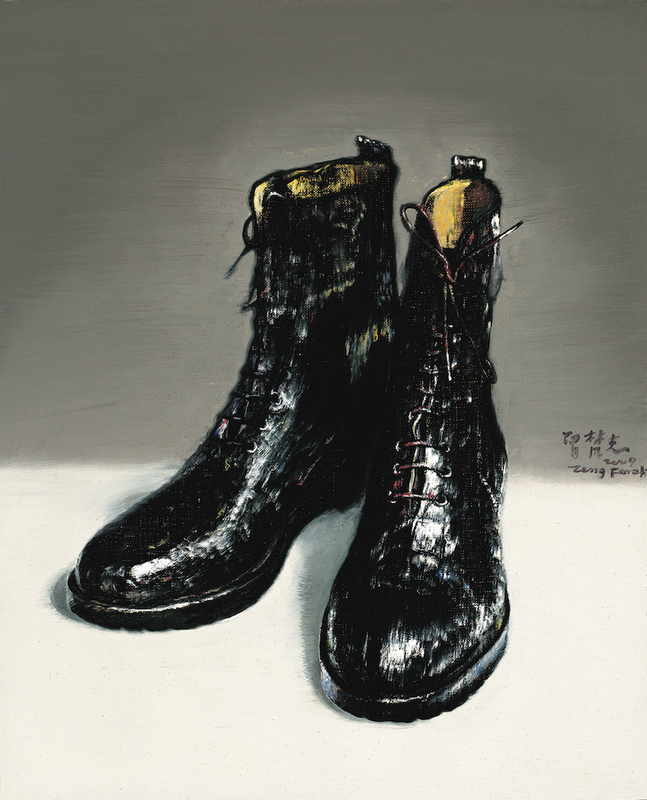 Remarkably, they also contribute to the larger discourse of figurative painting in China at the time. The pale, frenetic phantom of Parcours (1990) seemingly shrugs off the brushstrokes that compose him. 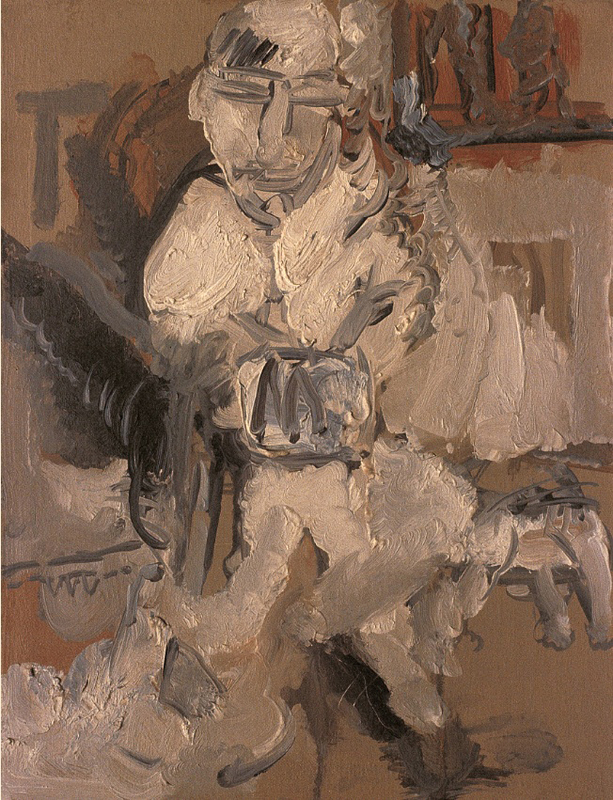 Compositionally reminiscent of Francis Bacon’s Study after Velázquez’s Pope Innocent X (1953), the most sinister of these images, Agony (1990) fuses the sitter in red with his chair, rendered in long, frustrated slashes of ochre. 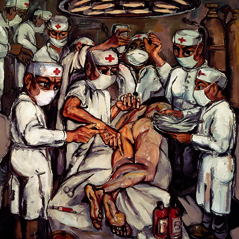 Realized in 1991 and 1992, the Xiehe Hospital series—and particularly the three triptychs with which it culminates—marks the emergence of Zeng Fanzhi’s mature style. 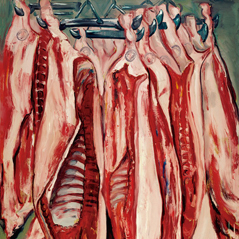 These were completed just before his experiments in the “Meat” series, and if they share with that earlier effort a singular focus on the carnality of daily life, they add layers of social observation and rigorous composition. 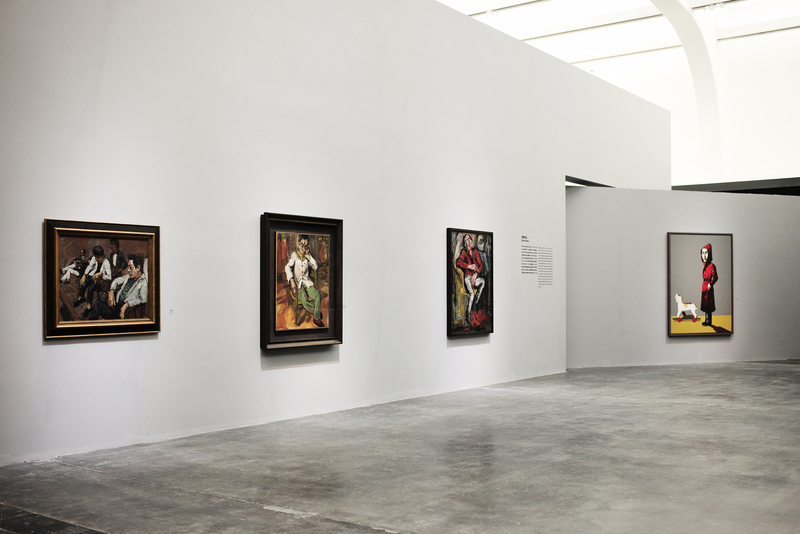 The two triptychs on view here contain 26 and 29 figures respectively, arrayed in configurations that evoke renaissance religious paintings, the gritty realist tableaux of Thomas Hart Benton and Thomas Eakins, and the tripartite imagistic grammar of Francis Bacon. 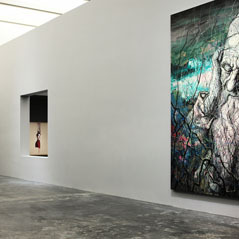 These works, included in the landmark exhibition “China’s New Art: Post-1989” which began in Hong Kong in early 1993 and subsequently toured to Australia and throughout the United States, were instrumental for the critic Li Xianting’s formulation of his concept of “Cynical Realism.” In a seminal 1992 essay entitled “The Anomie of Current Chinese Art,” Li argued that the Xiehe paintings “have a multivalent, metaphorical nature, depicting the treatment of the ill—itself a serious matter—as a way of making a poisonous joke.” Li goes on to compare Zeng to other artists of that moment, including Wang Jinsong and Liu Wei the Elder, who were “satirizing the outside world, so their images are handled in a way that is cartoonish, theatrical, and comparatively relaxed.” For the young Zeng, realizing works of this scale and complexity, and seeing them immediately put forward for international exhibition and circulation, emboldened a nascent stylistic confidence. We see in them hints of the pictorial motifs—masks, grins, draped forms—that would mark his next phase, as well as of the expressive brushwork that characterizes his more recent efforts. 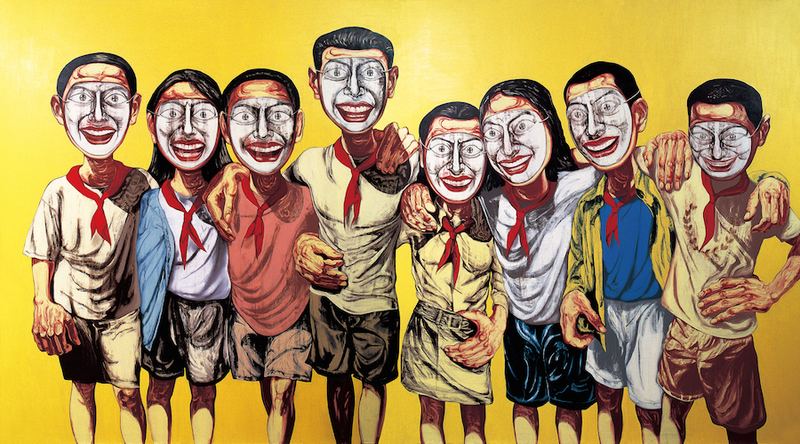 In 1993, Zeng Fanzhi left Wuhan to join the burgeoning art scene in Beijing, and a year later started producing the iconic “Masks” series. Masks appear as crucial symbols throughout art history and across multiple cultures, from Francisco Goya’s The Burial of the Sardine (1812-19) and James Ensor’s Self-Portrait with Masks (1899), to the masks that color Chinese traditional opera. 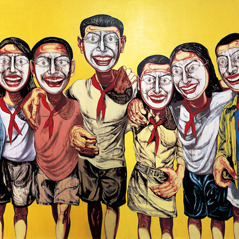 In Zeng’s works, masks perform the division between inner self and outward identity. 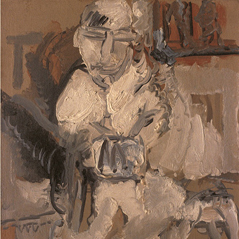 With faces covered, the figures convey a sense of alienation, loneliness, and anxiety. 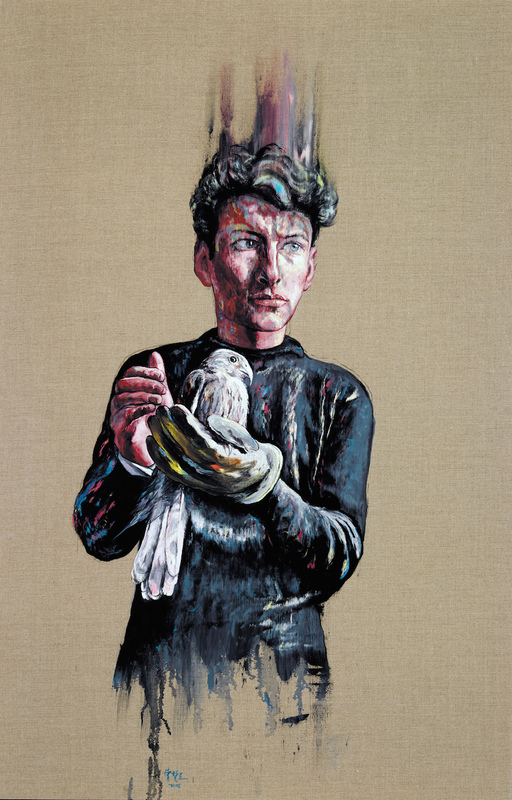 Depicting figures both idle and monstrous in exaggerated, stiff postures, these works leave one feeling ill at ease. In Mask No. 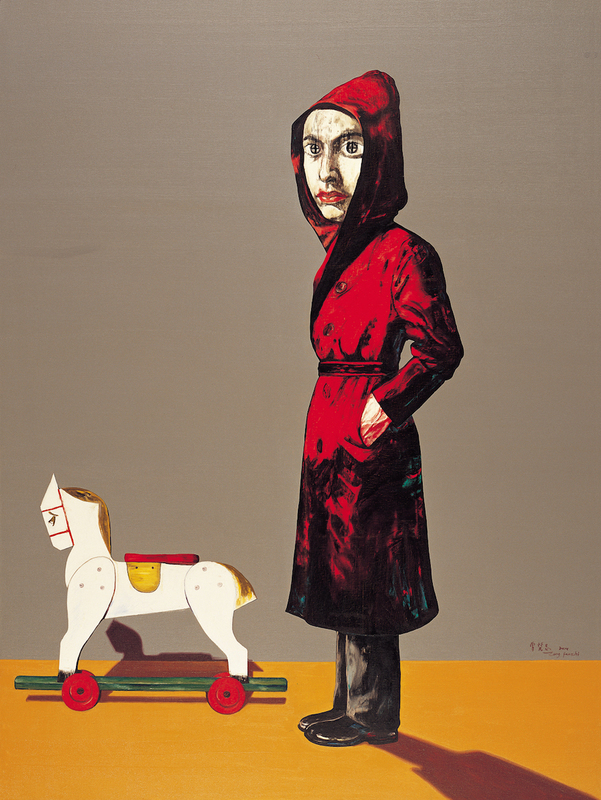 6 (1996), the composition appears to parody the youthful robustness of group portraits. Sporting red neckerchiefs and squeezed into formation, the figures don nearly identical masks, each with lips twisted in a forced smile. Their oversized hands, completely out of proportion with their bodies, and stiff postures betray nothing of their hidden emotions. Shades of yellow, hazel, and brown contrast with the bright red, creating a theatrical scene of stagnation and estrangement. 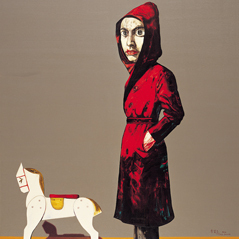 In Portrait (2004), the sitter is all but swallowed up by a stylish, hooded red coat and mask revealing nothing more than cold indifference. The wooden horse in the background contrasts with a sense of warm nostalgia underlain by deceit. Through elements like the red neckerchiefs, garishly colored flowers, and airplanes followed by long vapor trails, the “Masks” reflect the constrained physical and spiritual existences of their wearers, mining the impact of commodity and consumer culture on individual subjectivity. 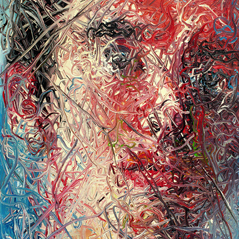 After 2000, Zeng adopted new techniques and methods to explore the field of portraiture, attempting to highlight “line” through form and content. 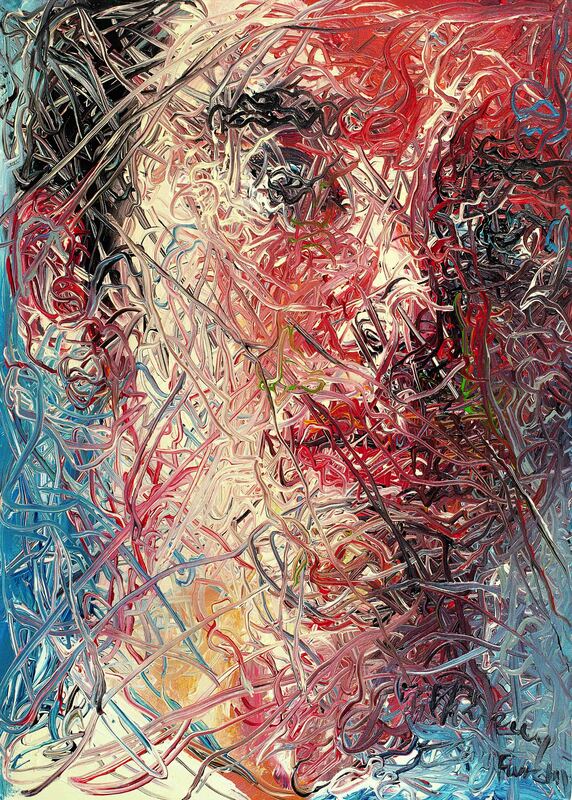 In We (2002), he studies the “features” of a figure’s face, painting layered sequences of spiraling lines that achieve a thick tactility. These destructive lines also give the painting a “mask” of its own and an accidental aesthetic beauty. In this period, Zeng explored an experimental language of painting that hints at future works in the “Abstract Landscapes” series. 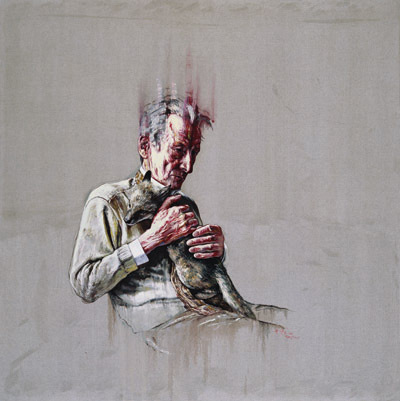 Around 2002, Zeng Fanzhi first jokingly used lines to “break” already completed portraits. After this, he slowly searched for ways to create paintings completely different from those he had done before. Beginning in 2004, he officially developed a new series of “Abstract Landscapes” using pure lines to express contours that lie somewhere between physical nature and mental construct. During this period, Zeng began to incorporate visual forms drawn from traditional Chinese culture, especially classical gardens. His detailed observation of plant life deepened his comprehension of the “rhythmic vitality” found in Chinese painting. 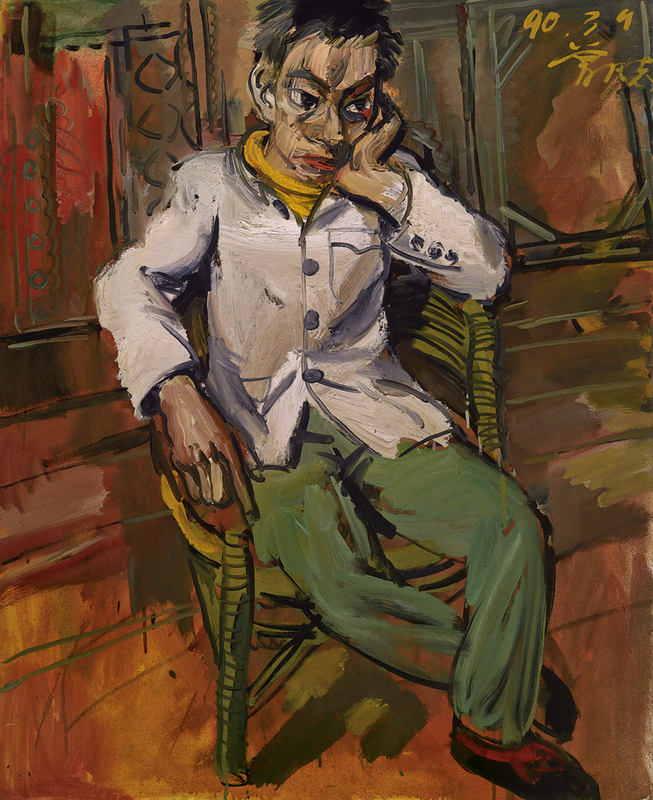 From this he developed a new set of artistic methods, using meticulously messy lines to evoke the vibrancy of life and attest to the presence of the artist’s hand and mind. He has subsequently used this method to depict everything from wild animals to heroes of Chinese Communist history. The technical difficulty of this series lies in the question of how to allow an intricate network of abstract lines to “breathe” without being rigid, while at the same time guaranteeing their fluidity, certainty, and continuity. In order to accomplish this, Zeng makes extensive use of a “wet technique.” This technique requires precise planning as well as maintaining a balanced and efficient painting speed. Paint must be mixed so as to extend its drying time. Zeng tends to think for a long time before starting on a painting, but then to complete it in one fell swoop. He outlines an image, colors it, and then begins the long process of deconstructing it with his signature chaotic brushstrokes. Ultimately, this results in a canvas that can be seen differently depending on where one stands: from afar, an image appears clear, becoming blurred as one approaches until it disappears entirely into a flurry of line. The play between these layers of visual information makes for works that are at once abstract and figurative, impressionistic and expressionistic. 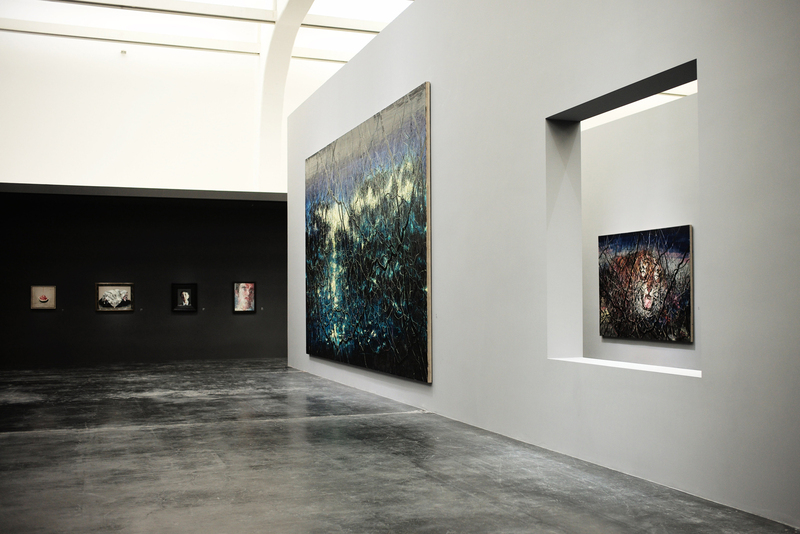 At the center of this exhibition lie a monumental group of four-meter square paintings which combine images from key moments in Western art history with Zeng Fanzhi’s signature chaotic brushstroke motif and palette. These seven works, which occupy the slender, serial walls that form the core of Tadao Ando’s design for this exhibition, are presented not in the order in which they were painted, but of the creation of the source image around which each resolves. 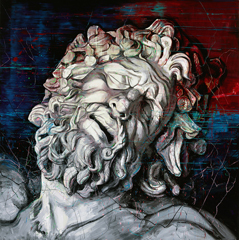 Beginning with an image of the head of the titular figure in the ancient Roman sculpture Laocoön and His Sons whose public display marked the origins of the Vatican Museums during the Renaissance, the sequence proceeds through two paintings based on works by Leonardo da Vinci (1452-1519), and four based on works by Albrecht Dürer (1471-1528). 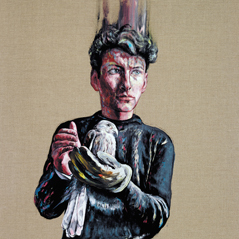 These daunting compositions function less as appropriations than homages: in their intricate brushwork and mimetic prowess, we see the artist working through the Western art historical tradition, gradually reconciling this heritage, from which he has drawn lifelong inspiration, with his own mature style. Zeng’s chosen subjects are notable not only for their fame and beauty, but for a depth of layered relationships that speaks to the artist’s understanding of them. The source works by Leonardo and Dürer—which encompass media including charcoal and chalk (Leonardo’s “Burlington House Cartoon,” 1500), watercolor (Dürer’s Young Hare, 1502), and pen-and-ink (Dürer’s Praying Hands, 1508), were completed between 1500 and 1521, bracketing the discovery and excavation of the Laocoön group in 1506. 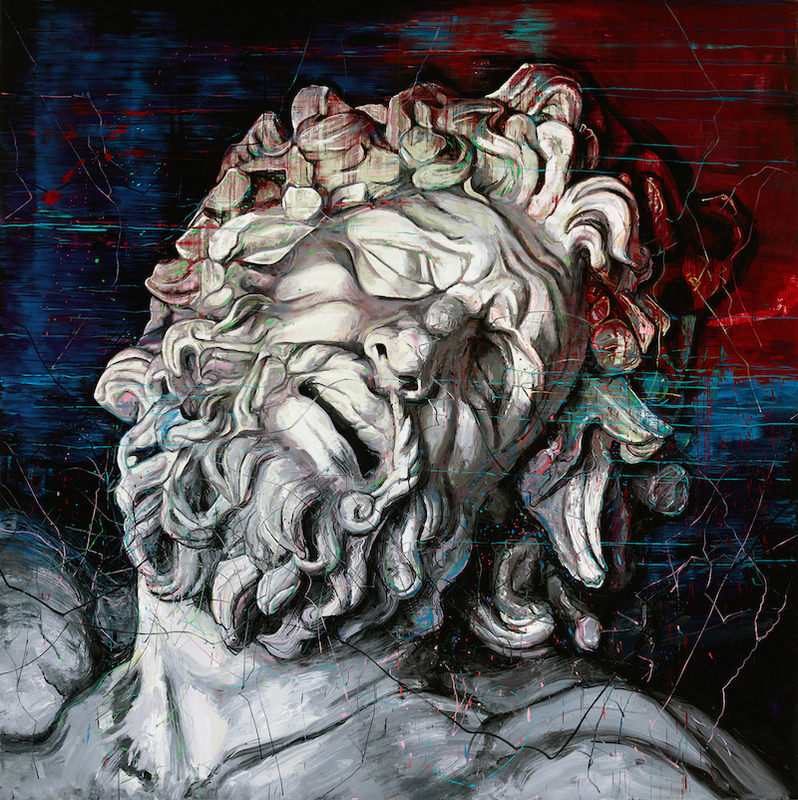 Sculpted in the late first century B.C., Laocoön, in its technical wizardry and idealistic vision of human beauty, inspired artists of the renaissance in the same way these renaissance masters have come to inspire Zeng. Installed here, they form a spine that runs through the exhibition, foregrounding the artist’s commitment to aesthetic research, cultivation, and ultimately innovation. This Land So Rich in Beauty No. 1 (2010) and This Land So Rich in Beauty No. 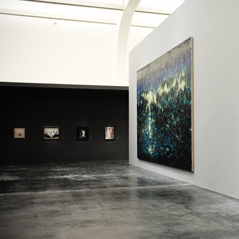 2 (2010) are key examples of Zeng Fanzhi’s “Abstract Landscapes,” a series on which he has been working continuously since 2006. In these, the two largest examples of that series to date, a great fire rages behind trees in the foreground, making for a sharp visual contrast between the deathly stillness that follows a blaze and the abundant life that precedes it. The title of this series is taken from a line in Mao Zedong’s 1936 poem “Snow,” later used as the title of the large landscape painting by Guan Shanyue and Fu Baoshi that has hung in the Great Hall of the People since 1959. 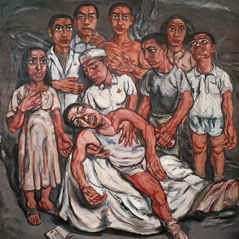 That earlier painting, a touchstone of Chinese art after 1949, was made both in praise of their country and as an expression of the artists’ great hopes for the Chinese nation. 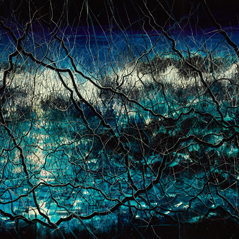 In using a title of great historical significance, Zeng is not only incorporating his personal views and artistic principles into the landscape, he is also alluding to the ideology behind the “grand narrative” that is promoted, knowingly or otherwise, by so much artistic creation in China. 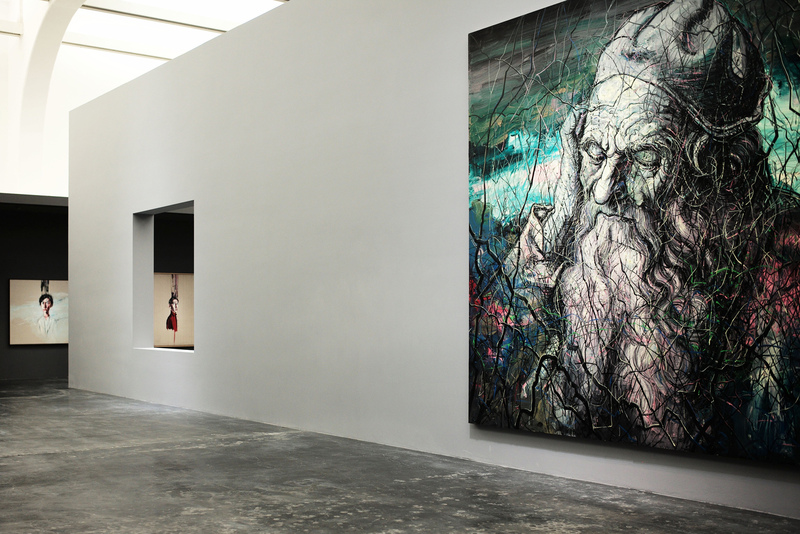 Despite their extremely simple appearance, Zeng Fanzhi’s sculptures have not moved toward a purely abstract style. 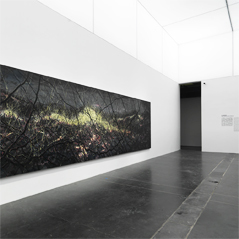 For example, the title In Search of Plum through Snowscape I (2014) hints at the work’s connection to plum branches and winter snow. It also reveals how the artist has borrowed from and shifted toward the subjects of traditional Chinese painting. The three pieces exhibited here were created using plant branches and mud-pouring techniques, demonstrating the integrative and systematic characteristics of Zeng’s working method. It is as if he is trying to extend the methods used in his landscape paintings into three-dimensional space, using lines to pursue the internal thoughts and bodily intentions of the subconscious. The sculptures, for all their materiality, still adhere to the lonely and hollow style found in the paintings. The still life has offered another venue for Zeng’s artistic exploration. 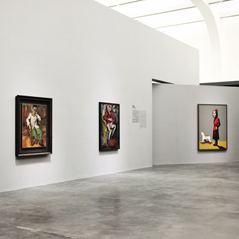 For example, Watermelon (2003) treats a motif previously found in the “Masks” and portraits, where it has generally appeared alongside human forms. In this intimate work of a watermelon alone, green rind and red pulp evoke symbolic meanings related to blood, politics, violence, religion, and everyday Chinese songs. In Zeng’s works, these meanings all become difficult to parse from each other. In the simple background, the artist left only faint traces of calligraphic lines of poetry, resembling those in the background of Self-Portrait (1996) and The Last Supper (2001)—since 2010, even these written cues have been erased from the series. To the viewer, it is as if there is only one slice of “pure” watermelon. 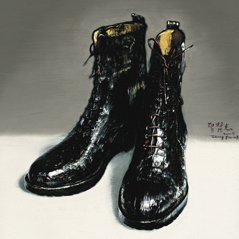 Another exquisite painting of a well-worn pair of boots—evoking labor, the body, and a range of artistic predecessors from Courbet to Van Gogh—is similarly archetypal. 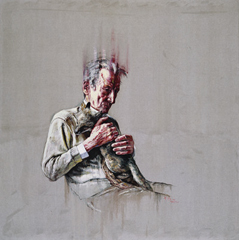 Since 2009, Zeng Fanzhi has devoted himself to the creation of a new body of works on paper. The images in these paintings, which hover between landscape and abstraction, have three types of origins. First, while Zeng was searching the globe for hand-made paper with unique fibers, he perfected his own use of the material, creating new and unique papers with the experts of STPI, a print and papermaking studio in Singapore. There he learned to uncover visual ideas and images from inside the grain of the paper itself. Second, these paintings also originate from the artist’s continuous collection and research on traditional Chinese ink painting; he incorporates a wide range of styles, concepts, theories, and practices from different periods of ancient Chinese painting. The resulting content offers a third language: a synthesis and transformation of the many different natural landscapes that exist in the world as the images he consulted in books or coaxed from pulp serve as the background upon which to reveal the artist’s own thinking. In this way, he brings about a reconciliation between painterly perspective and visible phenomena, melding the mental with the physical, the spiritual with the scientific, and the internal with the external.